The clavichord is an early keyboard instrument related to the dulcimer. Its keys operate wooden levers which at the other control small metal rods called “tangents.” The tangents do not create sound by plucking the string like a harpsichord, or by striking it like the piano, but rather by keeping the key suppressed at a particular or varying pressure. The resulting sound is quite small, but because the tangent stays pressed onto the string, the player can keep direct control over the tone and even impart vibrato, much as a contemporary lutenist or viol player could with his fingers on the fretboard. 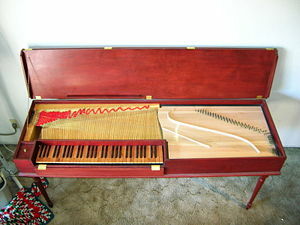 Also, by varying the pressure, the clavichord player has access to a large dynamic range—within the instrument's very quiet overall sound—a trait unique to the instrument before the appearance of the fortepiano in the 1740s. The clavichord's tiny timbre was never able to fill a large room, much less a concert hall, which also precluded its use in ensemble playing. It did however enjoy about three centuries – from the 15th to the 18th – as a training and practice instrument due to the necessity of a sensitive touch. In the final years before the piano began to rule supreme towards the end of the 18th century the clavichord was respected as an instrument on which the composer/player could express subtler emotions. Johann Sebastian Bach trained his sons (and wife Anna Magdalena) on this instrument, and Carl Philipp Emanuel Bach wrote sonatas that exploited its Empfindsamkeit—this emotional sensitivity. There is an electronically-amplified clavichord called the Clavinet, which was made by Hohner of Germany in the 1960s. It was widely used in funk music, most prominently on Stevie Wonder's hit "Superstition." This page was last modified on 14 July 2016, at 13:15.